Getting out for a run during our visit to Italy was difficult, both because we visited in July, when it’s very hot for most of the day, and because there is just so much to see! Just about every day in Italy we were up early to do a walking tour, line up for a gallery, or otherwise make our way to see some historic monument. That’s not a complaint, we got to take in quite a lot of Italy, but unfortunately most days we returned home too tired to do much other than crash into bed. I was eager to get out for a run in Rome and Naples, but just didn’t make it – the wine and pasta dinners may have also been a factor. 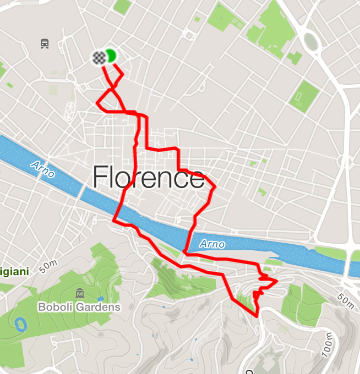 By the time we made it to Florence, it had been over a week since I’d been out and I was itching for a run. I had seen several other runners out while we were on our way to visit parts of the city, and I was staring to get jealous. Venice was a bit of a different story. We spent four days there mostly wandering around and getting lost along the canals, so I wasn’t short on time. However the labyrinthine layout of Venice, including it’s numerous bridges and dead-ends made for a difficult choice in run. I eventually spotted a longer straight route near the south of the city, and I was off. 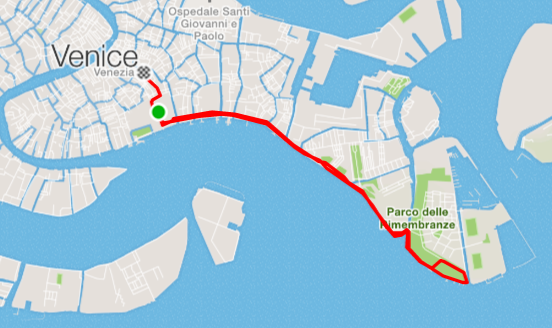 5km and 18 bridges later I got my run in Venice.